Disneynature Oceans trading cards. These cards feature beautiful scenes from the film and tidbits of information from the movie, like "More creatures live in coral reefs than any other habitat on Earth." Did you know that? I sure didn't. 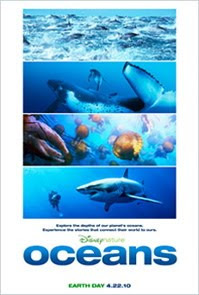 Disneynature Oceans free quiz on facebook. If you interested in nature and our oceans, you might enjoy testing your knowledge and see just how blue (or you might say green) you are. The quiz was a bit hard for me but I am always interested in learning more about the wonderful world we live in. How about you? Will you attempt the quiz and report back to let us know how you did? Order The Crimson Wing from Amazon. Disneynature's The Crimson Wing has not been released yet in North America but is available on blu-ray only as an import through Amazon. I love the ocean and all the diversity it holds. So cool that this movie is coming out. I hope to get a chance to see it! (Thanks for stopping by my BF community. Your thoughts and words are greatly appreciated).